This is as BIG as they come. Towering at six feet tall, this set is generally only used as a display set or for decoration only. It can be played as with the other sets however, we recommend a set of dollies or wheels for this set. 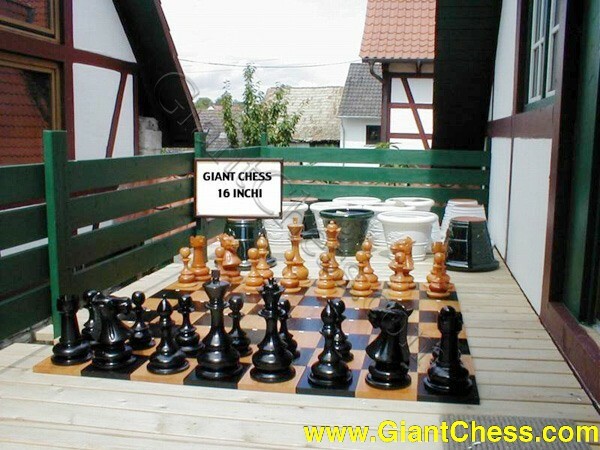 Mega Chess, Giant Chess, Colossal Chess, Gigantic Chess, Massive Chess...The list could go on to describe this set! 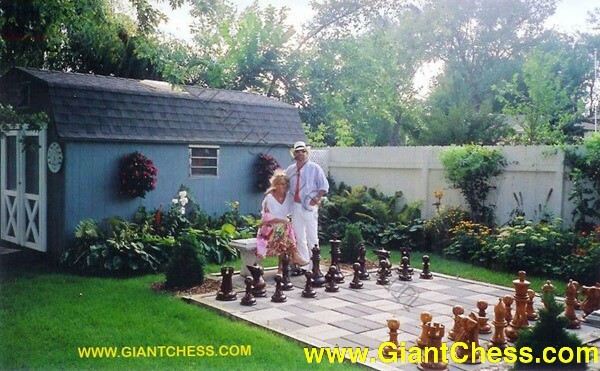 By far the most impressive set we have, the 72 inch Chess set is truly "life sized". The Granddaddy of them all! With a King weight of a wopping 50 lbs this set is the biggest and baddest of them all. 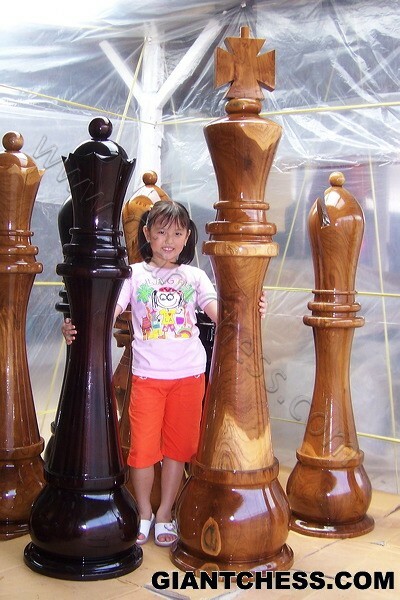 Even the Pawns are no slouch at 15 lbs and 20 inches tall. Approximately the same height and 2 1/2 times heavier than the average newborn child. 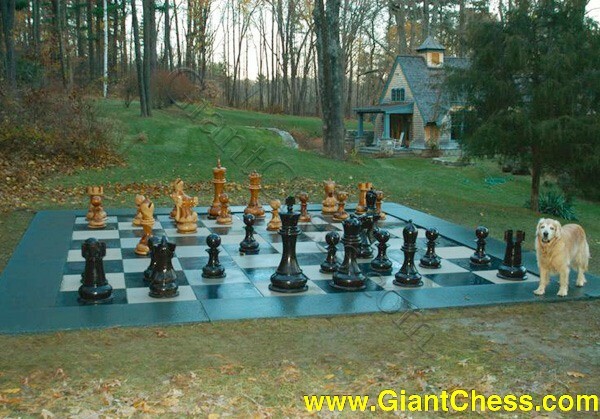 This mammoth Chess set is most definitely an outdoor set, unless you own the Biltmore Estate! The Forty Eight sets the standard for outdoor game entertainment. No need to "Keep up with the Jones' " here...you ARE the Jones' ! 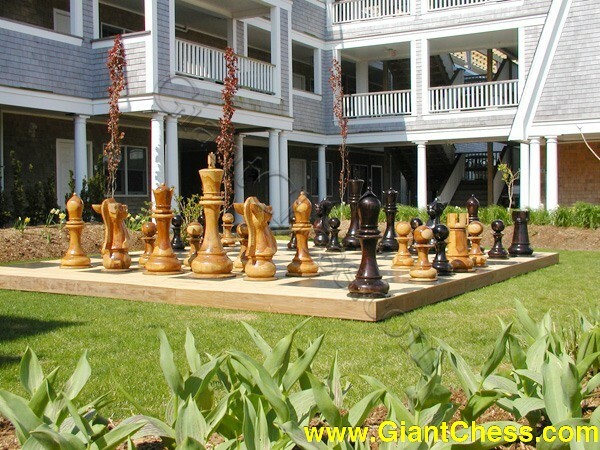 What better amusement, than to challenge your guest to a game of Giant outdoor Chess? Now you are getting into the "manly" size! Men always want bigger and better. Well, the Thirty Six will fit the bill. At 12 feet for the board and a hefty 44 lbs for the King, your man can certainly "Keep up with the Jones' ". This set is definitely not for the smaller player and pretty much requires its own Patio. Moving the larger Chess pieces can easily be done by tilting the piece on its edge and rolling it to the next square. As with any intelligent game of strategy, thinking ahead can most important. A set this huge brings a new dimension to the game. Our most popular size! Ideal for medium to medium-large areas. The Twenty Four is convenient for adults and children of all sizes. It's not too heavy, not too tall, it's just right! Only needing an 8 foot square area for a board, it will fit nicely into any Garden or Patio area. The Twenty Four is a very elegant looking set in the Garden or on the Patio without being too overpowering. This set would also be convenient for a Hotel or Resort. Click above to see a detail view. The 16" (40 cm) set is starting to get too large for indoor use unless you have a sizable area to locate the board. The Sixteen is a good size for kids. It's not too heavy, yet small enough that they can handle it comfortably. This size works well for medium sized applications. Although you do have to bend over quite a bit for The Sixteen, it's light weight makes it an easy set to play for any age for hours of family enjoyment and entertainment. The 12" set is also lightweight and can be transported easily. It is a little large to be played on the kitchen table but can be used in similar locations as The Eight. It is still small enough to be used as an occasionally played game and will not permanently take up floor space. Outdoors it can be located on a small Patio, Garden, Terrace, Veranda, Deck or in the yard. It is even suitable to play at the beach or at any other outdoor vacation location or event. The 8" set is lightweight and portable. Due to its size and weight this set can easily be packed and transported. It can be used either indoors in a game room, family room or even on the kitchen table or outdoors. It is great for a multi use room or as a game that is only played on occasion. It can be put away in a closet or even under a bed. The Eight's board is approximately 40" square and can be placed almost anywhere. The Eight is the second most popular set. Click above to see detail view.